Almost every blogger using Mobile technology to viewing the websites from their smart phones or iPhones. Now it is possible for bloggers to make their blog post from their mobile sets, because WordPress with its progressive nature presents itself as an ideal platform for creating blog posts from mobiles. If you do a WordPress publication or if you are a web developer providing WordPress solutions to your clients; I have compiled a list of best mobile applications that will help you and your clients to manage WordPress publications from anywhere anytime. As well You can find few Mobile Apps at WordPress.org which included: WordPress for iOS, WordPress for Windows Phone 7, WordPress for Android, WordPress for BlackBerry, and WordPress for Nokia. You can use iBlogger to manage most popular blog softwares including WordPress; it works great with iPhone, iPhone 3G, and iPod Touch.iBlogger allows you easily manage your blog including ability to add pictures, categories and tags. Support most of the mainstream blog platforms including WordPress; Support full options of blog: Labels/tags, categories, publish date and online draft(private post). You can easily write, edit and delete your posts and drafts for multiple blogs. 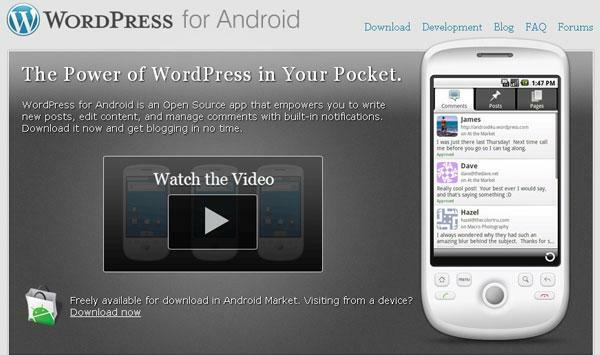 Allows you to manage your WordPress blog from your Android device. Features: upload new post including title, content, tags and multiple categories with multiple WordPress accounts, upload a full size image and thumbnail, customizable thumbnail sizing, option to publish instantly or save as a draft. PostBot is an Android application that allows posting to WordPress publications, both WordPress.com and self-hosted. WordPress for Windows Phone 7 makes it easy to manage your blog or website while on the move. Writing and editing Posts and Pages is a breeze, as well as being able to quickly moderate comments and check statistics. And it’s all made to get you in and out quickly. This is mobile version of one the best desktop client for bloggers, Windows Live Writer. Currently in beta it supports Windows Mobile 6 and newer. moBlog is a mobile blogging application for Windows Mobile 2003 and later. moBlog currently supports WordPress.com, Blogger and Live Spaces. moBlog is optimized to run on WM devices using minimum resources. It is an application that you can use in off-line mode, where you can do your writing and editing disconnected to the net. A connection is only required when you initially setup your blogging accounts and when you want to update your blog with the new content. WordPress for Nokia allows you to edit your existing blog content, add new posts and pages, manage comments, and more — directly from your S60 or Maemo-powered Nokia. Wordmobi is S60 client for WordPress written in Python for Nokia mobile phones. It allows you to manage your blog with common operations like posting, approve comment, post delete, and comments visualization. Scribe allows you to create, edit, and publish entries on your WordPress-powered blog from anywhere, using just your mobile handset. Scribe is in early stage of development and not completely stable. it uses Python for S60, so you will need install Pythod for S60 before installing Scribe. Wavelog is a blogging client application developed for S60 mobile phones with following main features: Post text, image, audio or video to a blog directly from the mobile phone using any type of available network (mobile phone or Wi-Fi network); Save draft for later posting, add hyperlinks, tags and external tags to your posts; Select blog category when posting, edit previously published posts and configure multiple blog profiles for simple publishing to several blogs. Wavelog has been developed for and tested on Nokia N95 mobile phones. There are many other S60 R3 based mobile phones on which the same software applications may be installed and used. MoPress is a blogging client application developed for mobile phones.It allows a mobile phone to post a content (text, image, audio, video) to a Blog, using any type of available network (mobile phone network or Wi-Fi network). MoPress has been tested with WordPress (v2.3.1 or higher) and uses XML-RPC protocol for communication with blog. 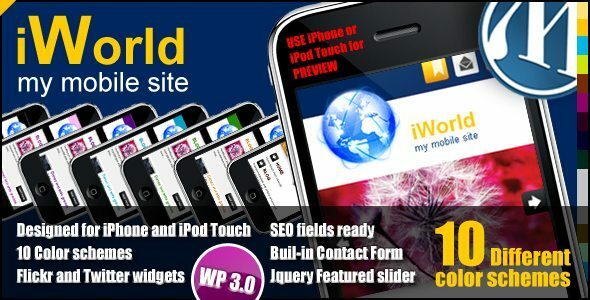 WPTouch is a mobile plugin/theme for your WordPress website. It automatically transforms your WordPress blog into a web-application experience when viewed from an iPhoneTM, iPod touchTM, AndroidTM, or BlackBerry StormTM touch mobile device. WPTouch has a very good admin options panel. Make sure you check out their gallery for screenshots. My Mobile Page WordPress Theme is a minimal mobile WordPress theme. With a modern look and a lot of cool features this can be the perfect pesonal mobile website for you. This theme can be used for personal mobile pages, web designers mobile pages, artists mobile pages and many other. The WP Mobile Detector allows you to display a mobile theme on WordPress sites to mobile devices in minutes. 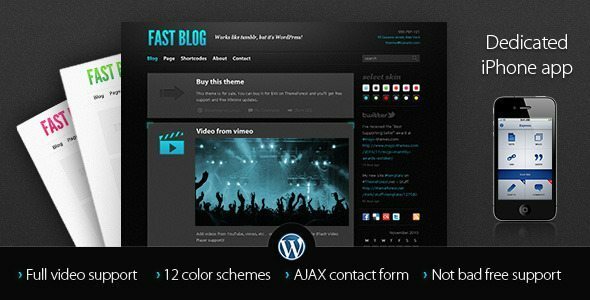 Simply install the WordPress plugin and activate it. WP Mobile Detector is a WordPress plugin that detects mobile devices and displays a mobile optimized theme specifically for each mobile device. 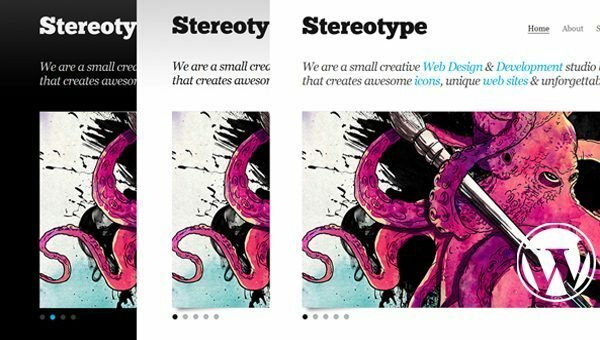 Stereotype is a clean and simple one page portfolio built on the 960 Grid System, HTML5 DOCTYPE and CSS3.